Find Career Mentors – Today! | Find meaning at work and advance in your career. Find Career Mentors – Today! When thinking of the word “mentor” most of us picture a one-on-one relationship. Usually, many of us see this person as guiding us throughout our careers, giving us advice, and meeting with us regularly. While all that can – and often does – describe a mentor, this type of relationship usually doesn’t come about immediately. First, you have to find someone who fits what you’re looking for, which may only come after several months of networking. Then, you’ll have to see if they’re able to devote the time and energy to helping you. Even if they want to, their availability may be far less than what you’re hoping for. So, what can you do? Fortunately, there’s another option: find people with careers you admire, learn about where they came from, and observe what makes them successful. This could be someone a few levels above you at your current organization, a former colleague you’re connected to on LinkedIn, or even an industry blogger you’ve never met. Yes, that’s right – your career mentor may not even know they’re your mentor! While it’s extremely valuable to have someone you can bounce things off of, it’s not the only way to learn from your role models. 1) LinkedIn: Here, you can easily see the path they’ve taken to get where they are today. You can also see what groups they’re a part of, and join them yourself. 2) At Work: Not only will it be easier to actually get face time with a potential mentor, you’ll actually get to see them in action. 3) Industry Participation: In which organizations are your career role models involved? Do they have a blog, write for a trade journal, or volunteer? One of the best things about this method is that you can watch how several association leaders have grown, take what works for you, and leave the rest! Prior to founding Weeks Career Services, Inc. Charlotte Weeks worked in human resources at a national association, where she experienced the hiring process from the other side. She's also the past president of The National Resume Writers' Association (The NRWA). Charlotte specializes in providing C-level executives (CEO, CFO, CMO, etc. ), association executives, executive directors and senior-level professionals (director, VP, SVP, etc.) with comprehensive career coaching services and high-ROI resumes. She is author of "I Want a Job in an Association -- Now What?? 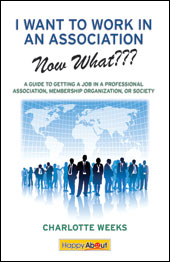 A Guide to Getting a Job in a Professional Association, Membership Organization, or Society" and featured author of "101 Great Ways to Enhance Your Career." Additional book contributions include "The Twitter Job Search Guide," "Resumes That Pop!," and "Step-by-Step Cover Letters." As an internationally-recognized expert, Charlotte provides programs and documents tailored to each individual’s needs. To ensure that each person is given the highest quality of attention and service, Charlotte works with a limited number of new clients each month. For more information about Charlotte, please visit her Web site at www.WeeksCareerServices.com. This entry was posted in Association Career, Career Management, Networking, Promotions and tagged association career, career advancement, career advice, career management, career mentor, Promotion. Bookmark the permalink. 1 Response to Find Career Mentors – Today!